The third of six Art Outreach Gallery STIC 2014 events is Thursday, October 2. ... Gallery doors open 5:30, showtime is 6:30. ... Hope to see you THERE THEN! We time-warp back a decade or so for the next two videos from the TED Talk archives! First up is a 2004 "talk" by best-selling author (and ace explainer! ), Malcolm Gladwell. In "Choice, happiness and spaghetti sauce," Mr. Gladwell expounds on the work of one of his personal heroes: the food scientist, consumer behaviorist and world-class happiness-maker, Howard Moskowitz. Our second featured video is from TED 2005 by the ever-prescient, social media prober, Clay Shirky. In "institution vs. collaboration," Mr. Shirky looks at how new communications technologies disrupt traditional ways individuals, groups and societies do things--as well as how new media enable novel ways to get things done. The law office of Heller, Maas, Moro & Magill is pleased to sponsor STIC 2014 Event 3. Follow the links below to view these two videos on-demand--as well as read interactive transcripts of the talks. You'll also find at the linked webpages, information about Messrs. Gladwell and Shirky including bios, homepage links, and book information. And remember, you can view view over 1700 TED Talk videos at www.ted.com! The next (second of six) STIC 2014 event is Thursday, September 18. Join in! Internet marketing seer/Connection Age sage Seth Godin's 2009 TED talk about connecting people and ideas still seems prescient! And gives several inspiring examples of how committed individuals led positive impactful movements. One not-so secret leadership secret: don't try to win people over to your cause; rather recognize, reach out to, organize and empower those that already share your passion. STIC Event Two is sponsored by heating & cooling contractor, Wm. Kramer & Sons, Inc. The STIC 2014 Season Sponsor is Jensen Lock & Alarm. Follow the links below to view these two videos on demand--or to get more information about Ms. Meyer and Mr. Godin, including bios, homepage links, and book information. The first of six STIC 2014 events will be held Thursday, September 4. 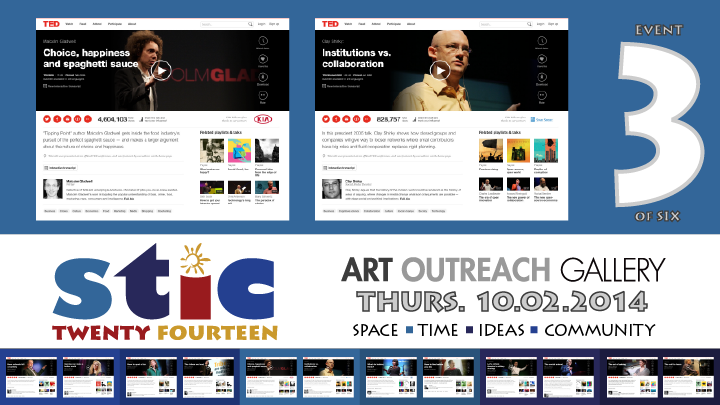 Each event features two screenings the TED Talks video library. The 2014 STIC (for "Space Time Ideas Community") season kicks off with Ken Robinson's 2006 talk about how students "grow out of creativity." (Short explanation: schools stigmatise being wrong. Sir Ken contends that when we lose the capacity to risk making mistakes, we lose the capacity for originality.) Join us and see why this engaging talk is TED.com's all-time most popular!